You are here: Home / DIY / Recycling Broken Crayons! I am sure your children have a box full of broken crayons. 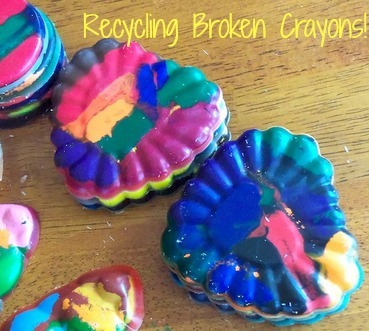 Instead of throwing them out, recycle them into molded crayons! This is a very easy project that the kids will love. You can make different shapes, multi-color or single color molded crayons. Gather broken crayons and peel the paper off. Cheap crayons work really well for this project. Even the ones that you get free at restaurants. The Crayola crayon labels are a lot harder to get off. I found a razor blade helped- just slice down the length of the crayon and peel the label. 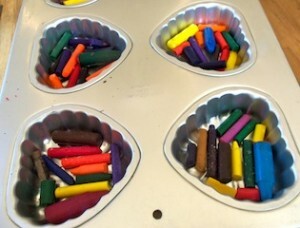 Place crayons in a muffin tin, metal mold pan, or silicone mold. We used a heart shaped pan and a muffin tin. Place crayons in a single layer. You can sort the colors or make a mixture like we did. Use an older pan just in case it colors the pan. Some of the crayons will stain the pan so we have a dedicated craft muffin pan. Place the filled muffin tin or mold into a preheated 350 degree oven for about 10-15 minutes. Once the crayons have melted, carefully remove the tin from the oven. Let it cool on a flat surface until solid. 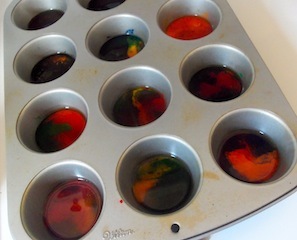 Place the tin or mold in the freezer for about 5 minutes and the molded crayons should pop out easily. You can also use a knife along the edge to pop them out. These would be great for little Valentine gifts for your child’s class!